If you missed out on that discussion of the CNS vs. the PNS, afferent vs. efferent PNS pathways, and the somatic motor division of the PNS, I’d recommend checking it out before continuing with Part II. 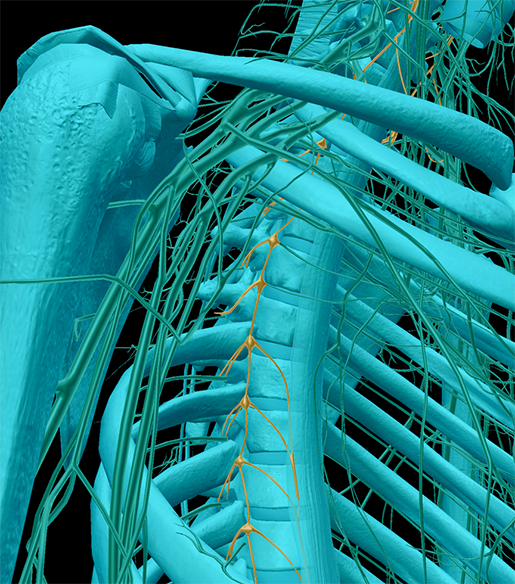 Now we’re going to complete the map by talking in detail about the Autonomic Nervous System (yes, it gets its own article because it’s honestly kind of a doozy!). The visceral motor division of the PNS is more commonly referred to as the autonomic nervous system (ANS). In contrast to the somatic division, which handles voluntary movements of skeletal muscles, all the workings of the ANS (aka visceral reflexes) occur involuntarily. The ANS regulates processes important to our survival. The medulla oblongata, part of the brain stem, is the CNS control center for visceral reflexes such as heart muscle contraction, vasomotor control, and respiratory rate and depth. The autonomic nervous system has two branches of its own: the sympathetic and parasympathetic nervous systems. The sympathetic and parasympathetic nervous systems regulate important body functions like breathing, heart rate, and digestion. A good way to tell the two branches of the ANS apart is to think about them like friends who have super different personalities (say...Kirk and Spock). The sympathetic nervous system is Kirk: loud and dramatic, ready to jump into the spotlight (and punch an alien or two) at a moment’s notice. It’s responsible for the visceral reflexes that get your body ready for action, including the famed fight or flight reaction. See those little yellow structures that look like beads on a string? The “beads” are ganglia. 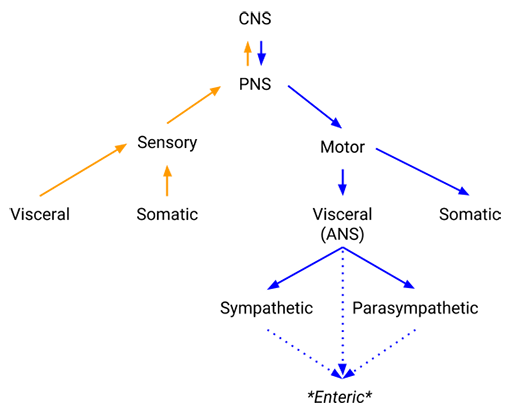 Sympathetic nervous system pathways have a preganglionic (before the ganglion) and postganglionic (after the ganglion) neuron. 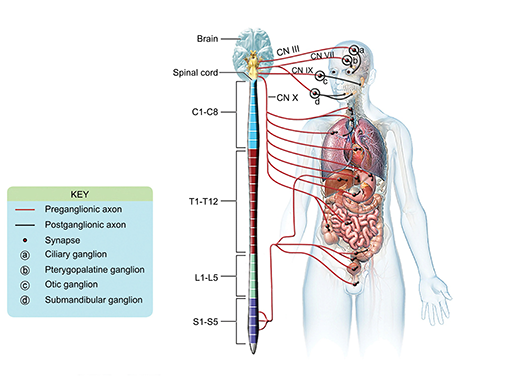 The preganglionic neurons tend to have shorter axons than the postganglionic ones because the ganglia of the sympathetic nervous system are nestled close to the spine. This allows for quick signaling of many different parts of the body when the stress alarm has been sounded. Speaking of which, some sympathetic neurons start at the spinal cord and go directly out to the adrenal glands, allowing for the immediate release of the hormones epinephrine and norepinephrine. You might know epinephrine better as adrenaline. That’s right—the feeling of an “adrenaline rush” comes from the sympathetic nervous system! Lastly, since the sympathetic nervous system’s job is to get the body into emergency mode, it inhibits functions it considers less important, like digestion. The parasympathetic nervous system is the much more even-tempered Mr. Spock. It sends signals that slow the heartbeat and respiration rate and allow for digestion to take place. If there’s something the parasympathetic nervous system needs to regulate, it does so more directly, instead of getting the whole body all riled up. In the parasympathetic nervous system, preganglionic neurons tend to have larger axons than postganglionic ones. The parasympathetic nervous system. Image from A&P 6. Now, there is another nervous network in the body that I haven’t mentioned yet: the enteric nervous system. Let’s call it the McCoy to the sympathetic and parasympathetic nervous systems’ Kirk and Spock. It’s in charge of its own area of the body (the digestive system), just like McCoy is in charge of sickbay, but it interacts a great deal with the other two. Though the ENS interfaces with the pieces of the autonomic nervous system, not everyone agrees that it should be considered to be an actual division of the ANS. It has about 100 million neurons, as well as its own reflex arcs, and it regulates secretion, blood flow, and motility within the digestive tract. 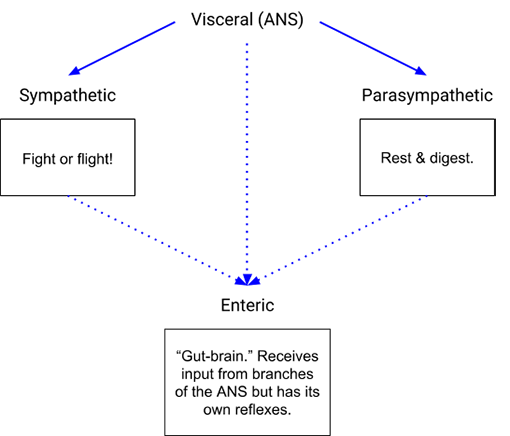 In addition, afferent neurons send information from the ENS back to the CNS to keep “central command” informed of matters such as tension in the gut wall or the acidity of the stomach. Up at the top, we’ve got the CNS and the PNS. Then come the PNS’s sensory and motor divisions, both of which are divided into a visceral and a somatic branch. The visceral branch of the motor division is more commonly referred to as the ANS, and it consists of the sympathetic and parasympathetic nervous systems. Whether or not we consider it to be part of the ANS, the enteric nervous system serves as a “second brain” dedicated to the digestive system. With all its divisions working together, the nervous system fulfills the important duties of regulating body processes, integrating information from the outside world, moving muscles, responding quickly to stress, and much more.